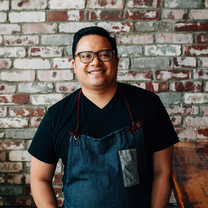 Dale Talde is a chef/co-owner of Talde, Atlantic Social, The Heights, and Massoni. A native of Chicago and raised by first-generation Filipino immigrants. 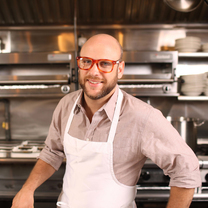 As a “Top Chef” alumnus, he effortlessly blends the tastes, ingredients and nuances of Eastern and Western cuisines and techniques. The result is a menu that explores new, and at times unexpected, combinations of flavors. "The truth at Mama Fina’s in Elmwood Park, the sisig was one of the best I’ve had, large crispy pieces of skin, tender moist pork also crisping in onion garlic scented lard. The lumpia was great, the bulalo(beef shank soup, with cabbage and carrot seasoned with fish sauce, the broth clean, but a slick of marrow fat draping the top like a custom suit. Great meal run don’t walk here." "Last lunch in Charleston @butcherandbee"
"A welcome to Charleston from Nina’s seafood thank you @mjtoscano"
"Moist, flavorful, and served with both a white yogurt and spicy red sauce, it comes with about three pieces of pita, rice, and a side salad for around $10. It’s ridiculous and super good." "It’s the perfect brunch dish: eggs, bacon, pasta, and cheese. Perfectly al dente, smoky, salty, and creamy. Did I mention perfect?" "If you try these gnudi, they will ruin gnudi for you—forever. They are almost like a ravioli, but much more delicate. They have the thinnest sheet of pasta wrapped around the freshest ricotta I’ve ever had." "It’s hot outside so come to @riceandgold and eat this , steak tartare, bone marrow kimchi, perilla, and Korean nori Photo credit@allgoodnyc"
"@taldejc It’s simple. Start with our wings (available in four varieties and at 6 for just $10 on Monday) and finish with steak. Can you think of any better way to chase down the weekend? #mondays"
"Get to the roof bar at the 50 Bowery hotel stat for the @meatballers rice+gold special foie gras-men and duck meatball noodle soup. Comes with a tasty side salad and the best views in manhattan." "The new new @massoninyc porchetta, provolone, spicy rabe, dipped in gravy, lunch or brunch"
"taldejc ・・・ It's Tuesday night which means ssam dinner at Talde. Tonight we have lechon kawali, lumpia shanghai, garlic fried rice, ube cheesecake, & a pitcher of Singapore Sling for $35. Limited quantities available #comeandgetssam"
"cait_cal ・・・ Come. Eat. Pizza. INDUSTRY NIGHT TONIGHT! 8-12 at @#illbethere"